A pulsar is the crushed core of an exploded star, a rapidly spinning cinder that repeatedly swings a beam of light in our direction. 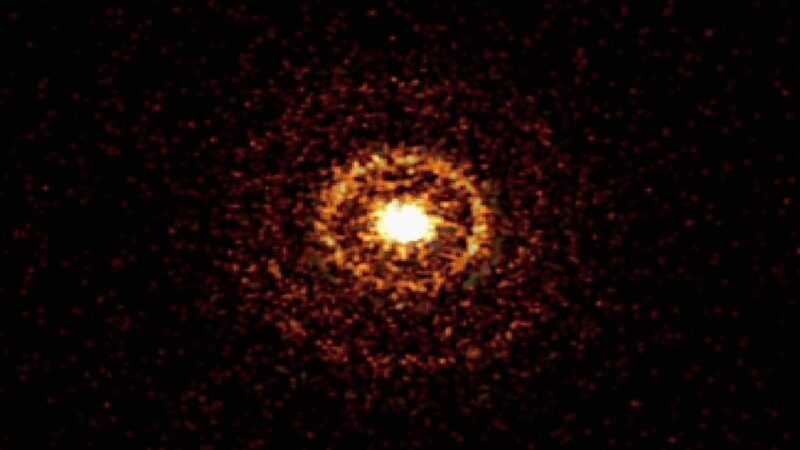 Check out the post “Lighthouses in Space” for more about what pulsars are, how they work and why we study them. On the eve of the 50th anniversary of the first pulsar observation, we’re looking back at pulsar highlights from our division’s Rossi X-ray Timing Explorer, or RXTE for short. 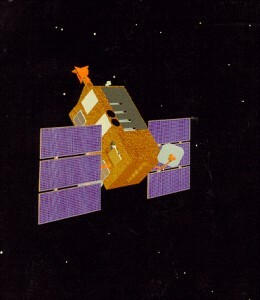 RXTE operated from December 1995 to January 2012 and was designed to observe fast-changing objects. It was able to observe changes in X-ray brightness on timescales ranging from thousandths of a second to several years, making it the perfect observatory for pulsar science. I asked a couple of our pulsar experts to list RXTE’s top five pulsar-related discoveries. They told me it was a challenge to limit themselves to only five discoveries, but here’s what they came up with, in no particular order. The fastest-spinning pulsars clock in at dizzying speeds, rotating tens of thousands of times per minute. These pulsars are called millisecond pulsars because their period of rotation can be measured in milliseconds. The first millisecond pulsar was discovered in 1982 using radio observations, so they were well-known by the time RXTE launched. The question was how they reached such incredible rotation speeds. A pair of discoveries in 1998 using RXTE observations of an object known as SAX J1808.4-3658 provided important clues. One study found the pulsar and timed its X-ray pulses, while the second found that a low-mass companion star orbits the pulsar every two hours. 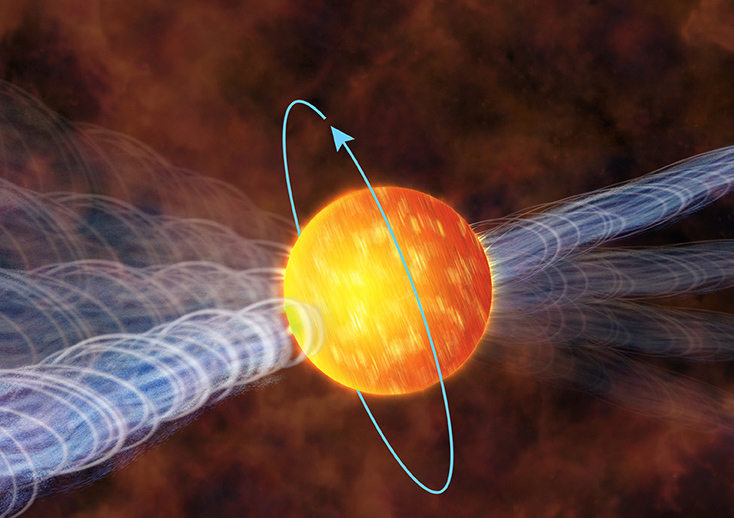 At the time, it was thought that millisecond pulsars started their pulsar lives rotating more slowly, but get “spun up” by taking material from a companion star. These studies provided the first strong evidence for this view, which has since been confirmed by other pulsars in binary systems. They spin that fast because material from their companion has brought in some of the companion’s angular momentum. The sun and moon eclipse each other as seen from Earth, but eclipses occur in many other types of astronomical systems. Such eclipses give us unique opportunities to study the objects involved. RXTE found a binary system called Swift J1749.4-2807 where a millisecond pulsar is regularly eclipsed by its companion star. RXTE’s precision timing of the pulsar’s signal, coupled with the eclipses, gave astronomers a detailed view of the system. With further observation, it should be possible to determine the mass of the neutron star – often a difficult task. 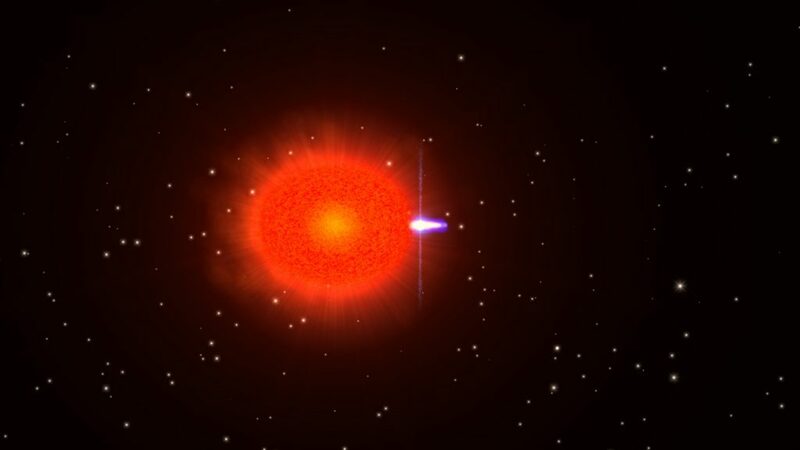 When a neutron star finds itself in a close binary system with another star, it’s companion may “donate” some of its outer-layer material to that neutron star. The donated material – hydrogen- and helium-rich matter – piles up on the surface of the neutron star until it suddenly undergoes a runaway nuclear reaction. This nuclear “burning” creates hot-spots on the surface of the neutron star. Previous missions had discovered the thermonuclear bursts. RXTE gave us our first glimpse that the burst starts at a hot spot on the neutron star. By carefully timing the X-ray signal received during an outburst, researchers were able to detect pulses caused by rotating hot spots. 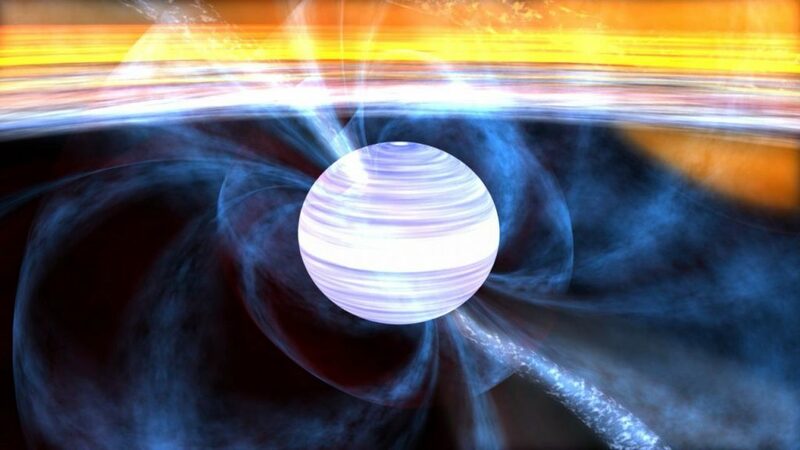 Thus, astronomers had a new way to observe the spin of neutron stars. The fastest-spinning neutron star observed this way to date is 4U 1608-522, which is spinning at about 620 Hz, or 37,200 rpm! This image shows the X-ray halo from the flaring neutron star SGR J1550-5418 as seen by NASA’s Swift satellite. Credit: NASA/Swift/Jules Halpern, Columbia Univ. RXTE helped solve the problem of soft gamma repeaters – cosmic objects that emit large bursts of gamma-rays at irregular intervals. The first soft gamma burst probably from a neutron star was observed on March 5, 1979, by the same satellites searching for gamma-ray bursts. It soon became clear that the March 1979 burst was not an ordinary gamma-ray burst. For one thing, there were repeated bursts coming from the same region of space, instead of the normal one-and-done bursts that had been detected before. One hypothesis for the origin of these soft gamma repeaters, which are called “SGRs” for short, was that they were neutron stars with stronger-than-normal magnetic fields, known as magnetars. If this was the case, the bursts would slow down their rotation. By combining the precise timing information from RXTE with data from Japan’s Advanced Satellite for Cosmology and Astrophysics (ASCA for short), researchers were able to measure how SGR 1806­20’s spin had changed over a few years. In that time, the pulsar’s spin increased by 0.008 second. A tiny amount, to be sure, but it happened over just four years in an object with more mass than our sun – a significant amount, given the circumstances. The slow down could only be explained by a neutron star with ….a million billion times stronger than Earth’s. A neutron star with such a strong field was given the name “magnetar” by the theorists who first modeled how the field could lead to the bursts. While we often think of pulsars at the most accurate clocks in the universe, they do occasionally undergo sudden changes in their spin rates. These events are called “glitches,” and astronomers have known about them since the early 1970s. Typically these glitch events are unpredictable, happening suddenly and without notice. However, after monitoring one particular pulsar – PSR J0537-6910 – with RXTE over about eight years, researchers noticed a pattern. They found that the time to the next glitch appeared to be related to the spin increase associated with the previous glitch. In fact, they were able to predict when the next glitch would occur within a few days. The ability to predict the glitches in PSR J0537-6910 bolsters the current view of how glitches happen. Neutron stars have a solid surface composed of normal matter – atomic nuclei and electrons. Beneath this rigid crust, a so-called superfluid of neutrons becomes added to the mix. Current thinking is that glitches are caused when the rotating superfluid abruptly transfers some of its spin energy to the crust, resulting a sudden change in its rotational speed. A special thanks to Tod Strohmayer and Jean Swank for weighing in on their top RXTE pulsar discoveries.